Our devices offer solutions for noise, space, distance and security concerns, data center control, information distribution, conference room presentation, school, corporate training and so on. ●Five HDMI Inputs switch to one HDMI Output. ●Support 4K@60Hz UHD signal input and output. ●Support Remote control and HDMI auto switch. ●LED Status Light shows clearly the working state. ●In 4K@60Hz HDMI UHD resolution, HDMI Input and Output distance can be up to 5M while using AWG26 standard HDMI Cable. In other HDMI resolution, HDMI Input and Output distance can be up to 8M while using AWG26 standard HDMI Cable. We supply worry-free 18-month warranty. Feel free contact us if you have any questions. 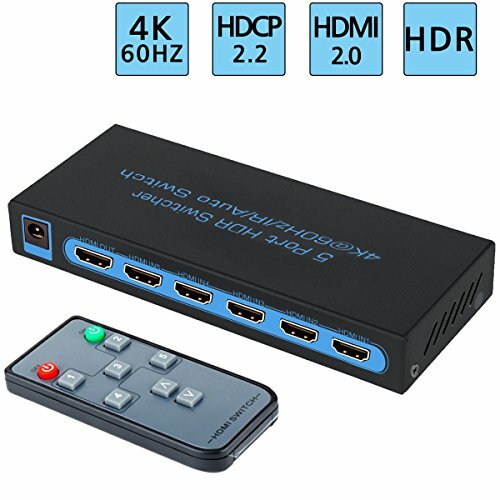 ★4K ULTRA HD 5 IN1 OUT: This HDMI Switch connects up to 5 UHD HDMI sources on a single display and easily switchs between 5 sources. Support bandwidth 18Gps/600MHZ, HDCP 2.2, 4K 60HZ 4:4:4, FullHD, UHD, CEC, DeepColor to 36bit. ★AUTO-SWITCHING With REMOTE :This HDMI Switch has a pre-programmed automatic switch program.It jump over to the next active input source automatically when the current one is powered off. The HDMI Switcher automatically switches to the last selected source input when restart.You can press the "switch" button on this product for 5 seconds to turn off the automatic switch function! Select and view the desired HDMI source device just by a switch of the remote or push the front-panel push button. ★12-Month Warranty: Easy to install and Play.We are manufactory which Specialized in HDMI solutions for years.We supply worry-free 18-month warranty. Feel free contact us if you have any question.